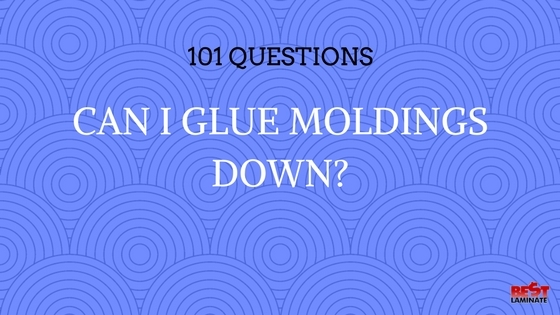 Home >> 101 Questions Series >> 101 Molding >> Can I Glue Moldings Down? The question of if you can glue moldings down was touched on in our previous blog post, “Do I Have To Use Tracks With The Moldings?“, but we will elaborate more on this topic in this post. So… Can I Glue Moldings Down? Yes, you are able to install moldings with glue. This type of installation is especially recommended if you have cement sub floors. Place a few heavy objects on the moldings overnight to ensure that it does not move while the glue dries. As always, be sure to read the molding manufacturer installation instructions before your begin. For more information on specific molding types, and installation instructions, visit our Help Pages. How Long Should The Flooring Acclimate Prior To Installation? Can I Glue Underlayment Down On My SubFloor?